If you have a sewer back-up to report call the number listed above. If this is not an emergency, and you wish to report an issue, or request assistance, please visit Yak Back. The City of Yakima provides for the treatment of wastewater from the City of Yakima, Union Gap, Terrace Heights, and Moxee. The responsibilities of the Wastewater Division include the operation and maintenance of the wastewater collection system, lift stations, and the treatment plant. Responsibilities also include the monitoring of all industrial and commercial users of the system to ensure that substances which could be harmful to the treatment system, or process, are not discharged into the collection system. Wastewater discharged to the WWTP is conveyed through miles of sewer pipes and several lift stations. It is then treated through many stages, which include grit removal, clarifiers, digesters, aeration basins and ultra violet disinfection. Once the water quality standards are met, the treated water is returned to the Yakima River. 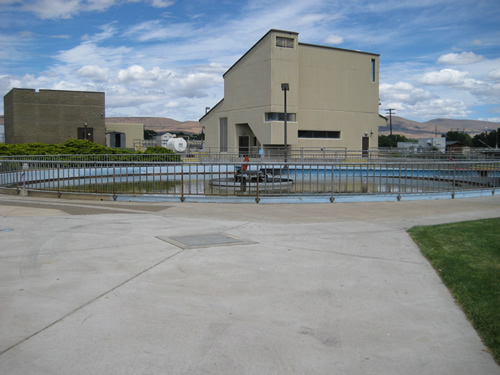 Currently, the Wastewater Treatment Plant (WWTP) treats approximately 10 million gallons per day (MGD), with a peak average of approximately 17 MGD, and has the capacity to treat up to 21.5 MGD. The treatment of wastewater and its discharge to the Yakima River are authorized by the National Pollutant Discharge Elimination System (NPDES), Permit number WA0024023, which was last issued Oct 1, 2011 and will expire on Oct 31, 2016. The primary goal of the WWTP is to maintain compliance with environmental regulations related to water quality and to provide services that are related to public health and safety. In addition to adhering to the rules and policy related requirements, the City of Yakima is dedicated to reducing the environmental impact on other parts of the surrounding community by investing in infrastructure that reduces our energy costs, reducing our operation and maintenance costs, improving the quality of safety and health to the public, and maintaining adherence to the City’s approved budget and policies.